I love summer entertaining! Maybe it’s just me, but everything about summer parties is more relaxed and casual. Guests show up in t-shirts and sandals, we chat and nosh on the porch at our leisure, and thanks to the longer days, we can linger much later into the evening enjoying each other’s company. The easiest way I know of to harsh the mellow of a summer party is to spend the entire day leading up to it in a complete frenzy of preparation and cooking. Okay, I feel that way generally about any party but in summer it seems almost a crime to ruin a great party with a crazy day. To help keep all our summer parties just a little (or a lot) on the laid-back side, I put together this dinner party menu that comes together largely the evening and morning before. You’ll do a bit here and there in preparation but you’ll have most of the day of the party to yourself to relax at will. You’ll be refreshed and relaxed when your guests arrive which will set just the right tone for this party. This menu serves four guests but every recipe on it can easily be doubled or tripled for a larger party. In total you’ll spend about four hours preparing for this dinner, including setting the table and cleaning up, but most of it happens the evening and morning before your guests arrive. You’ll have most of the day before your party to yourself to relax or, if completely necessary, run errands or get things done around the house. Personally I vote for relaxing so you can be well-rested when your guests arrive. The detailed minute-by-minute, blow-by-blow for this menu is also available in PDF form with specific times for a 6:30 pm dinner. Review all of the recipes carefully and make your grocery list. If you’re comfortable with what’s involved with each recipe preparation and cooking will be much easier. You’ll need about an hour for these preparation activities. You can also do all of this prep work the morning of the party, just quick cool the bulgur and vegetables in the freezer for about 15 minutes before you chop and mix them. You’ll need about two hours for all of these activities, but then you are largely off the hook until about 90 minutes before the party. You’ll need to put the ribs in to cook mid-day but that’s a quick and easy bit of work. Take a quick break from your afternoon of relaxation to put the ribs into the oven. They’ll fill your house with a great smell as the slowly cook. This last hour and half is when you’ll be busy finishing the menu and getting everything served and plated. How early into this last 90 minutes your guests arrive is totally up to you. If they arrive earlier you can chat with them in the kitchen and even enlist their help. You may be more comfortable without an audience though and if that’s the case I’d suggest asking them to arrive 15-20 minutes before you plan to serve dinner. 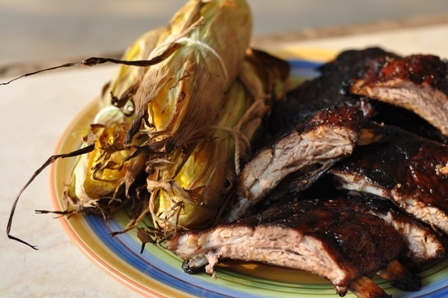 They’ll see you pull the ribs and corn from the grill which will only whet their appetite. Don’t assemble dessert until you’re ready to serve it or the puff pastry stars will be soggy. It comes together quickly though so you won’t be away from your guests for long. Puff pastry makes this light strawberry shortcake come together in no time flat. Inspired by Blueberry Cobbler with Sugared Star Shortcakes. Combine the strawberries, sugar, and vanilla extra in a medium bowl. Toss to combine and refrigerate for at least 30 minutes and up to two hours. Unfold the puff pastry sheet and roll lightly to smooth the fold marks. Using a star cookie cutter or other shape of your choice, cut 12 puff pastry stars. Carefully place the stars on a baking sheet. Mix the egg white and water together in a small bowl with a fork. Lightly brush the top of each puff pastry star with a some of the egg wash.
Sprinkle each puff pastry star with a bit of raw sugar then press the sugar into the pastry lightly with your fingers so it sticks to the egg wash.
Bake the puff pastry stars for 12-15 minutes or until puffed and golden brown. Move to a rack and allow to cool. 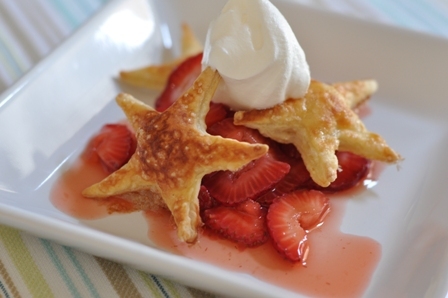 To serve, scatter 3 puff pastry stars on a plate, top with the strawberries, and garnish with the whipped cream. You can make the puff pastry stars the night before. Store them in an air tight container to help keep them crisp. Don’t let the strawberries sit in the sugar for more than 2 hours or they will get mushy. You can use any combination of berries for this recipe that you’d like. Pick the best seasonal fruit and you won’t go wrong. Sliced fresh peaches would also work well with this preparation. Be sure to taste them before you add sugar so you don’t over sweeten them. For a slightly more grown-up taste, add 1 Tsp. balsamic vinegar to the strawberries, sugar, and vanilla. Or, just before serving, chiffonade a few leaves of basil and toss them with the strawberries. Don’t mix the basil in in any earlier or it will turn black.